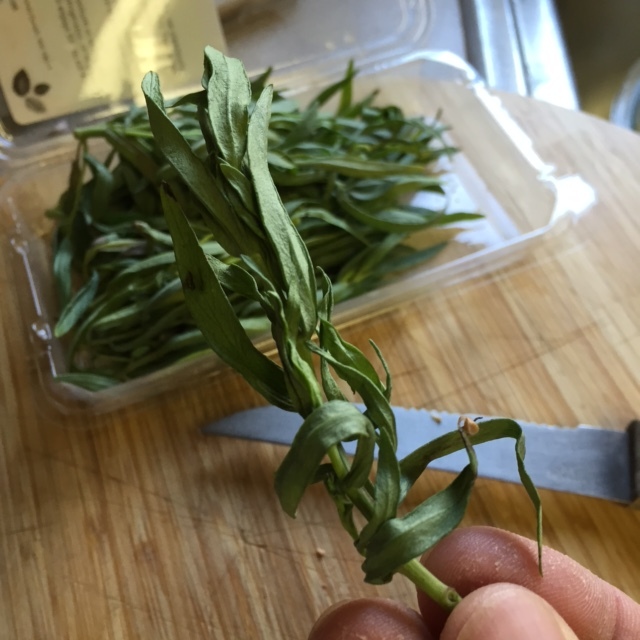 Fresh tarragon has an intense flavor over dried tarragon. When the herb is dried the oils dissipate. You can store tarragon from 3 to 5 months in the freezer, doing so retains the most flavor of fresh tarragon during storage. There is no need to defrost the herb before using it. Dried tarragon should be kept in a sealed container in a cool, dark place and used within 1 year. Heat greatly intensifies the flavor of tarragon. Though is may not look like it, tarragon is a species of perennial herb in the sunflower family. There are variations of the herb and they include “French tarragon“, which is best used for culinary purposes, “Russian tarragon”, typically better than wild tarragon but not as good as the French tarragon, and “wild tarragon”. If you are wondering what the flavor of tarragon is, we would describe it as slightly peppery and it has a taste that’s somewhat similar to fennel, anise or licorice. Tarragon has great health benefits. It contains trace amounts of minerals including iron, potassium, and small amounts of calcium. It also contains vitamin-A, a nutrient essential for healthy eyes. This is herb is one of the recommendations to reduce your risk of macular degeneration. Shallots: Part of the allium family, which includes onions, garlic and scallions. Shallots also help to ward off cancer. They also contain 34 micrograms of folate, which is good for brain and nerve function. Sugar Snap Peas: They are a good source of vitamin-C, a nutrient that protects DNA structures from damage and improves the immune system. The sugar snaps also contain folate, which helps to improve heart health. Low levels of folate can raise levels of homocysteine, which increases the risk of heart disease. Folic acid is a synthetic form of folate. If you are taking the B-vitamin as a supplement, it is recommended to take the natural form, folate. As noted folic acid is a synthetic oxidized form, and is not found in fresh natural foods as is folate. Because it is synthetic, is not bio-available to the body, as is folate. 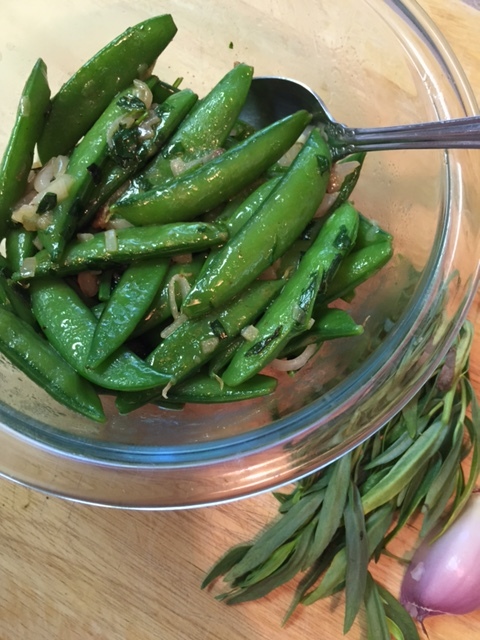 Now for our featured recipe – Sugar Snap Peas with Tarragon – and here is what you will need. 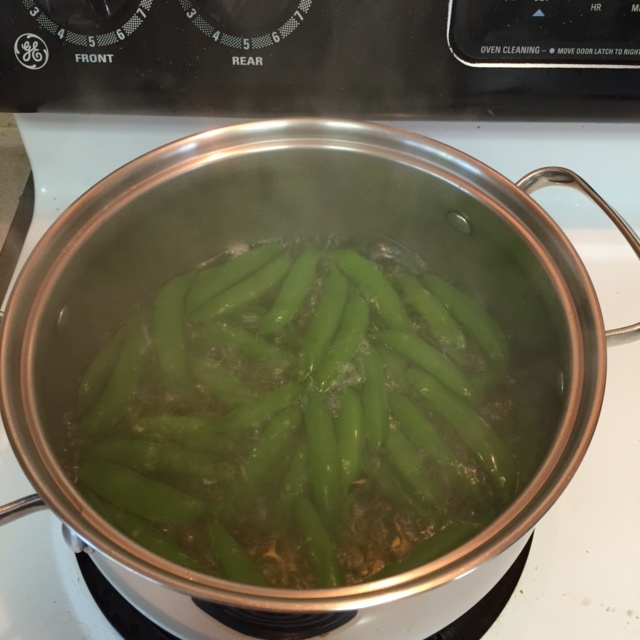 In a large sauce pot, bring water to a rapid boil, and add snap peas and cook until they turn bright green, about 3 minutes. Drain, and set aside. 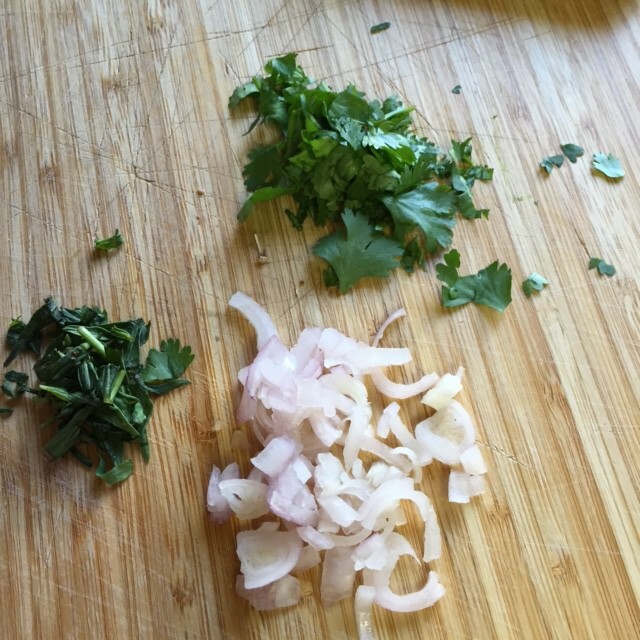 Mean time, prepare the tarragon, cilantro, and shallots. In a large ceramic coated skillet over medium heat, add butter and melt. Next add shallots and cook until soft, about 3 minutes. Next whisk in a splash of fresh water, about 1 to 2 tablespoons, then add snap peas and cook 2 to 3 minutes. Next add chopped tarragon, cilantro, and mix in with snap peas and shallots. Spoon cooked sugar snap pea mixture into a serving bowl, and serve with your favorite main dish. This entry was posted in Side Dish and tagged American Heart Association, Asparagus, Austin, Folic Acid, Food, Health, Leaf vegetable, Levomefolic acid, Microgreen, Pregnancy, Salad, Texas, Vitamin. Bookmark the permalink.